Congrats from the US to England on the birth of the 3rd royal heir to the throne. Happy for William and Kate. 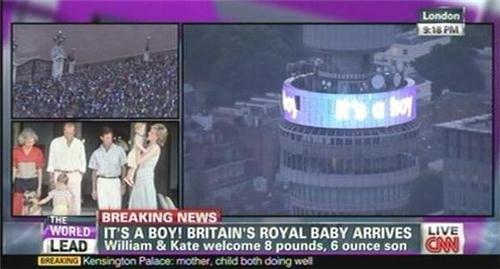 At 189m high, the birth announcement of the new prince in lights on the BT Tower in London. Congratulations from Hungary! Best wishes to the baby and for the parents!!! Congrats to the happy family from Denver!!! Excited to see the new generation of royals bringing joy and light into the world! Any word about the Middleton family? If they arrive is it likely the media will know about it? Londoners: Get your earplugs ready. Gun salutes are planned at several locations around the city on Tuesday. Here's what else is coming up. As Hilary mentioned earlier, gun salutes are planned at Green Park and the Tower of London later today to celebrate the new royal prince (details here) -- but that's not the only sonic celebration that will be going on in London. At Westminster Abbey, where William and Kate were married in April 2011, the bells will be rung for three hours to mark the birth of a new heir to the British throne. Celebrations continue in London today. Right now at Green Park and the Tower of London, there are are gun salutes for the new baby prince. 41 rounds are being fired at Green Park while the Tower of London will see a 62-gun salute. The reason for the difference in number of rounds fired depends on location. Numbers explained -- There is a 41-gun salute at Green Park -- A basic royal salute has 21 rounds plus an additional 20 rounds for a royal park. Meanwhile Tower of London sees 62 rounds fired -- again 21 for a basic royal salute, an additional 20 rounds because it is at a royal palace and then 21 more because it is in the City of London. Each round is fired every 10 seconds. Great "Kate wait" almost over? 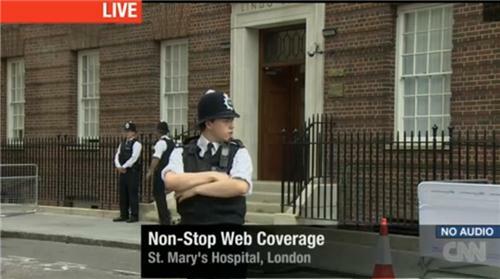 Want to keep watch with us at the Lindo Wing? Here's the live stream link. Please bear with us when we go live on location as the live stream camera is used in those moments. 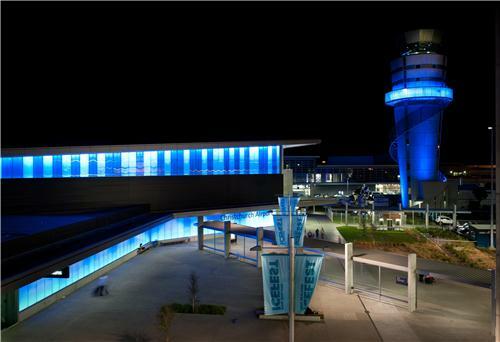 But don't despair -- we return them to you for your viewing pleasure as soon as we've gone off air. 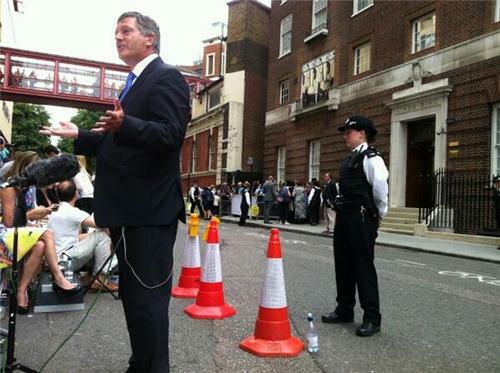 Carole and Michael Middleton have come out of the hospital and are expected to speak to the crowds of reporters waiting across the street from the Lindo Wing. The Duchess of Cambridge's parents Michael and Carole Middleton are leaving the Lindo Wing out of the main gate after meeting their grandson for the first time. They were there for just under an hour at the hospital. They stand on the stairs to pose for photographers before heading towards the press for a few comments. With both parents beaming, Carole Middleton answered a few questions from screaming photographers. "He's absolutely beautiful. They are both doing really well. We're so thrilled," she said. When describing the first cuddle with the newborn prince, the Duchess' mother happily responded, "Amazing." 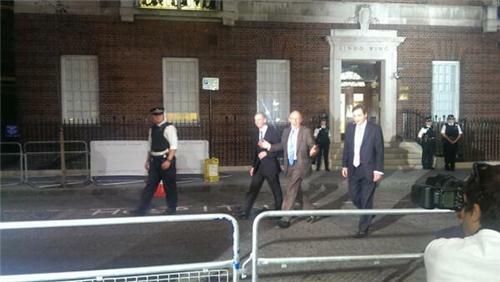 They then thanked the press and got in a black cab to leave. 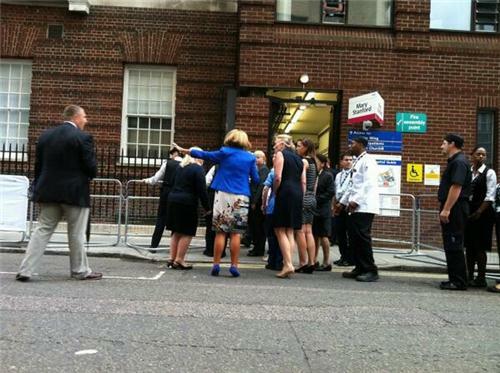 Prince Charles and his wife Camilla, Duchess of Cornwall, have arrived at the Lindo Wing of St Mary's Hospital in London to visit Charles' new grandson, the royal prince, who was born there just over 24 hours ago.